In the UK, gravel driveways have shot to popularity, replacing block paving as the nation’s favourite material. It’s easy to see why it has become so popular too, not only looking great, but being easy to maintain too. It’s hugely successful in creating an aesthetically pleasing look, especially in the country settings where materials tend to be stone and brick. With gravel driveways you’ll also have a wide variety of choice, with the size of area covered, colour and texture. 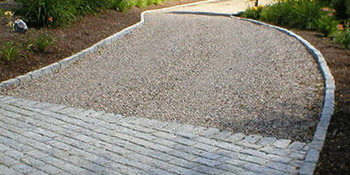 As an added benefit, gravel paving can even act as a security measure, alerting you to anyone coming towards the house. The maintenance of gravel driveways is generally very straightforward. Of course, as with anything it will eventually deteriorate over time and dirt, dust and weeds will begin to take over. To keep the fantastic look gravel paving originally creates it’s important to maintain. This can be just removing weeds and spraying weed killer, or sweeping escaped gravel back into place. If a vehicle is constantly using the surface, the top gravel layer will eventually need replacing over time. The weight of the vehicle will slowly break down the gravel pieces and make the surface compact. Gravel driveways offer something different to block paving, creating a fantastic look that needs little maintenance throughout the year. For up to four FREE quotes from specialist providers, just complete our quick form and hear from vetted and reputable professionals in your area. Project: My paio and paths re-laid as many of existing large slabs now wobbling and uneven. Not sure what would be best solution so need advice and maybe several quotes for different solutions. Project: Need our a patio and path laying in our garden. The space is already excavated ready to be paved. Stonecrafts Tommy is a lovely chap, gave an excellent quote, I would recommend his services. A1 premier group - very honest professional chap great communication. Trademaster have proved to be very professional they have quoted accurately and kept within the stipulated time frame for completion. In addition they have completed the work to a very high standard and I would highly recommend using trademaster. All the tradesmen were polite, helpful and a pleasure to have on site. It’s difficult to give you anything about their work as they cannot proceed with my job until the weather improves so only then can I give you an honest answer if their work comes up to scratch? Very friendly and easy to deal with. Also very efficient in quoting and carrying out work, pleased with the driveway installed. took all the searching away. Easy peasy to use. Properties are given an energy ranking dependent on how efficient they are and ratings are displayed in the information beneath. This varies from A, the most energy efficient, to G, the least efficient. With a higher rating you're more likely to have less expensive energy bills as more heat is going to be retained inside your home. You'll be able to increase your home's efficiency with insulation such as double glazing, loft lagging or wall cavity insulation. The data underneath indicates the different types of homes in Uk. Essentially the most common properties all around the UK are detached and semi-detached households. Other kinds of houses encompass terraced houses, flats, converted flats and bungalows. The pie chart underneath illustrates the proportion of properties within Uk that are central heated and non-central heated. Central heating figures in the vast majority of UK properties, including those on the gas grid and houses heated by oil and electric. The information below shows the spread of homes warmed by different fuels. Throughout the United Kingdom the most common by far are gas heated houses, followed by electricity and then oil. Biomass boilers are also increasing in popularity, heated by eco-friendly products such as wooden pellets or agricultural waste.|Homes in Britain are heated by a variety of fuels, which include gas, electricity, oil, solid fuel and LPG boilers. Each fuel has a varying cost associated with it which means you may find yourself with less costly energy bills by switching the way your property is heated. Even solar thermal panels are being regarded as by many people as a way to cut heating bills for the many years to come.